The 2012 hurricane season is off to an active start. Two storms have already been named and the season does not officially begin until Friday. Tropical cyclones, known as hurricanes in the United States, can develop around the globe at different times of the year. In this country, we are most affected by the Atlantic hurricane season, which runs from June 1 through November 30. Peak activity, however, is usually in late August to mid- September. A hurricane season is an extended period of time in which the majority of storms are likely to develop. This tends to happen in the summer months, when the temperature difference between the sea surface and the air aloft is greatest. NOAA is forecasting a near-average number of storms this year, despite the pre-season arrival of Alberto and Beryl. Below are the details of NOAA’s forecast for the 2012 season. Wettest City in the U.S.
“Rain rain go away, come again another day.” With rain on fourteen of the last twenty-four days, this old nursery rhyme sums up the feelings of many New Yorkers. For the residents of Hilo, Hawai’i, however, this sentiment is not an option. Hilo is the wettest city in the United States. Situated on the windward coast of the island of Hawai’i, the city is in the path of the moisture laden Trade Winds. Averaging 126 inches of rain annually, Hilo experiences every conceivable type of rainfall, from mist to downpours. Looking at the calendar’s point of view, some form of precipitation falls there 272 days of the year on average. As soggy as it may sound, Hilo’s amazing tropical rain forests, waterfalls, and rainbows would not be possible without this significant precipitation. While traveling among the Hawaiian Islands, I had the opportunity to visit Haleakalā National Park. Ascending its volcanic slopes, I was struck by its summit region known as “kua mauna”, the land above the clouds. Its unique view is made possible by an elevated temperature inversion. In the troposphere, the weather layer of our atmosphere, air temperature usually decreases with height. An inversion occurs when something causes that situation to reverse and allows air temperature to increase with height. 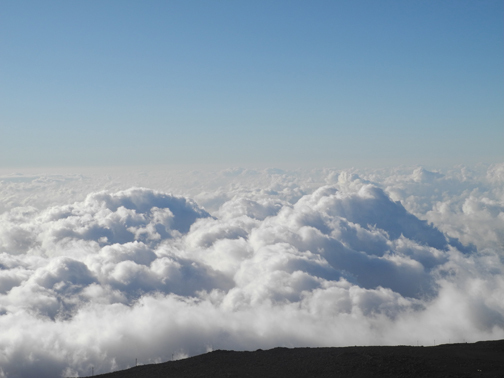 At Haleakalā , the inversion is caused by a large-scale subsidence in the Trade Winds. Blowing from centers of high pressure across the Pacific, cool, dense air aloft is warmed by compression as it descends to lower altitudes. In opposition, solar heating warms air near the surface allowing it to rise and cool, forming clouds. When these cool clouds meet the warmer air above them, an inversion layer is formed. The inversion layer acts like a cap for cloud convection. Therefore, the summit of Haleakalā (10,023 feet), rising above the inversion altitude, stands out like an island in a sea of clouds. The island of Hawai’i is a place of tremendous climate diversity. From tropical to sub-arctic, the Big Island has it all. Hawai’i has eleven of the thirteen climatic zones defined in the Koppen Climate Classification System. Developed by Wladimir Koppen in 1884, this climate system is based on average values of temperature and precipitation as well as the distribution of native vegetation. Hawai’i only lacks the extremes of cold winters and summer heat waves. The primary reason for this wide range of climates is topography. Two huge volcanic mountains, Mauna Kea (13,796 feet) and Mauna Loa (13,679 feet), dominate the landscape of Hawai’i. Since air temperature decreases 3.6°F per one thousand feet, it can be in the 80’s at the beach and below freezing in the summit regions on any given day. Mauna Kea, the White Mountain, even supports a seasonal snow-pack. These mountains also create orographic rainfall and affect the overall distribution of precipitation on the island. When warm, moist air is forced up along the windward slopes, it condenses into clouds that produce rain. This precipitation supports the island’s lush rainforests and cascading waterfalls. The leeward side of the mountains, where the air descends, is sunnier and more arid. The vast assortment of climate zones on Hawai’i is remarkable for an island roughly the size of Connecticut. In many ways, Hawai’i is an island of all seasons. Climate, the long term statistical average of weather conditions, helps describe the character of a region. Technically, every place on Earth has its own climate. To deal with such tremendous variety, scientists set up categories. They organize locations with similar characteristics into groups. The ancient Greeks were among the first to attempt climate classification. They divided the world into three zones: torrid, temperate, and frigid. Today, the most widely used scheme is the Koppen Climate Classification System. Wladimir Koppen (1846-1940) was a German climatologist working at the turn of the 20th century. He developed a climate system based on monthly and annual averages of temperature and precipitation. Koppen also believed that a region’s vegetation was its best expression of climate. So, the natural distribution of native plants heavily influenced his zonal boundaries. Over the years, people have expanded this system to better suit their needs. While the number of sub-categories differ, most are based on Koppen’s original idea. Since returning from Hawai’i, everyone has been asking me, “Why aren’t you more tan?” My response is, “SPF 70 and a hat.” The UV index in Hawai’i ranges from high to extreme, so sun protection is necessary to avoid serious sunburn and other long-term skin problems. The UV index is a scale that measures the intensity of the sun’s ultraviolet radiation reaching the Earth’s surface. Readings vary from place to place as local factors affect the amount of UV light that reaches the ground. These include, the thickness of the ozone layer, latitude, season, elevation, and cloud cover. Developed in the early 1990’s by the NWS and EPA to warn the public about the risk of overexposure to the sun, it is calculated on a daily basis for every city in the U.S.
Hawai’i is located in the tropics at approximately 20°N latitude. As a result, the sun sits higher in the sky as compared to the mainland. When the sun’s rays are more directly overhead, they filter through less of the atmosphere and are therefore more intense when they reach the ground. 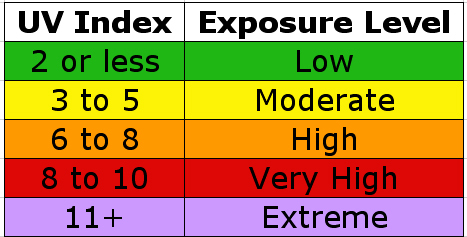 Consequently, the UV index in Hawai’i is higher than any other location in the U.S. It averages around 7 in the winter and 11+ in the summer. April was both warm and dry here in New York City. The month ended with an average high temperature of 54.8°F, which is 1.8°F above normal. The extended warm spell in the middle of the month, which included a high temperature of 88°F on April 16th, helped contribute to the above average readings. In terms of precipitation, April’s famous showers were few and far between this month. The city only received 3.56 inches of rain, which is 0.94 inches below normal. This is the fourth consecutive month that we have received below average rainfall. In fact, the city is now in a state of moderate drought, according the NOAA drought monitor.